The Cirrus® Encore player is a seamless, flat-style player that displays your playlist in a scrolling fashion. 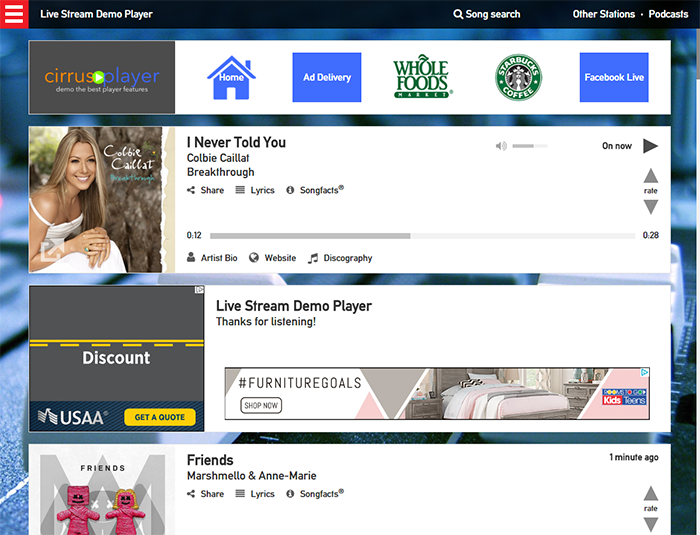 Allow listeners to become fully engaged by exploring artist info, following along with lyrics, rating songs, and much more. The player caters to any type of station; you can add any custom RSS feed (or use one of our presets) and it’ll add a ticker tape at the bottom of the player. Whether you’re a music, sports, news, school or religious station, you can keep listeners informed all while listening. If you have podcasts or on-demand content, they will also appear on the Cirrus® Encore player. Listeners can search podcasts by keyword for easy access. You can fully customize the Cirrus® Encore by selecting a color scheme, adding top menu buttons, and enabling/disabling player apps... Plus, you have full advertising control or you can turn the inventory over to our Ad Delivery Network to earn additional revenue.